Cook the soba per package directions. When done, rinse and set aside. To prepare the broth, place water, kombu and shiitake in a saucepan. Cover, bring to a boil and reduce heat to medium-low. Remove kombu after 4 minutes and set aside. Continue cooking shiitake for another 10 minutes. Reduce heat to low and add shoyu. Heat the oils. Add the tofu and shoyu. Stir fry until tofu is hot and browned. Using hands, squeeze the juice from the ginger onto the tofu and mix. Remove from heat. 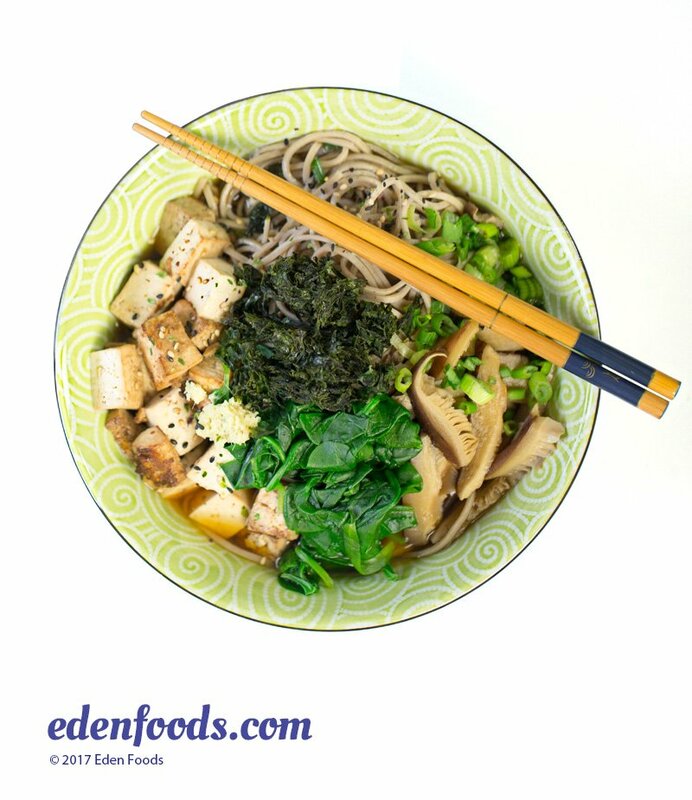 Place the soba in serving bowls, ladle shiitake broth over and garnish each bowl with equal amounts of tofu, scallions and Nori Krinkles.